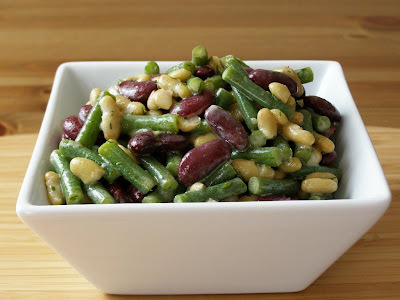 I love this salad, it's a change from 'traditional' 3 bean salads as I personally don't like all that sugar in those. As I love dill and lemon I thought I would try them together and it works really well, a nice light fresh salad. 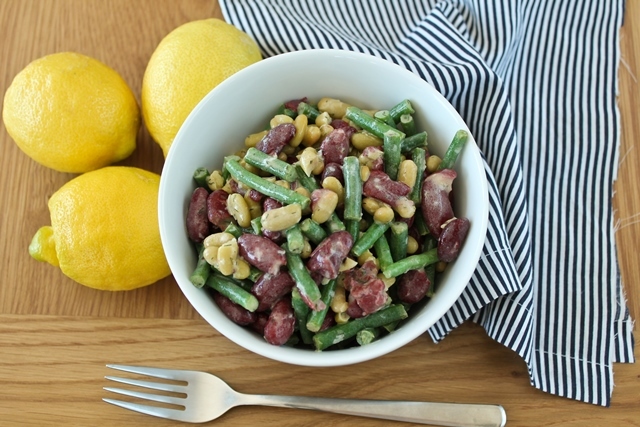 While the green and kidney beans are traditional I know the flageolet are not....but they should be, their mild creaminess go perfectly in this. Besides, given the choice I would use flageolet in place of almost all beans, king of beans they are!! Salad is best the next day when it's had time to soak in the flavours. -optional - 1/4 tsp of sweetener of your choice. Only if you feel it needs it, sometimes I add 1/4 tsp of Sweet Freedom Syrup (it's vegan and tastes just like honey) depending on my mood! Steam the green beans until just fork tender then refresh under cold water until cool. Place in a bowl with the other beans and mix. In a small bowl add the olive oil then slowly whisk in the lemon juice and mayo until well mixed. Whisk in the salt and dill then pour over the beans and gently fold in with a rubber spatula. Chill well, preferably overnight. 2013 update - I've been loving this salad wrapped up into large romaine leaves - goes beautifully together! 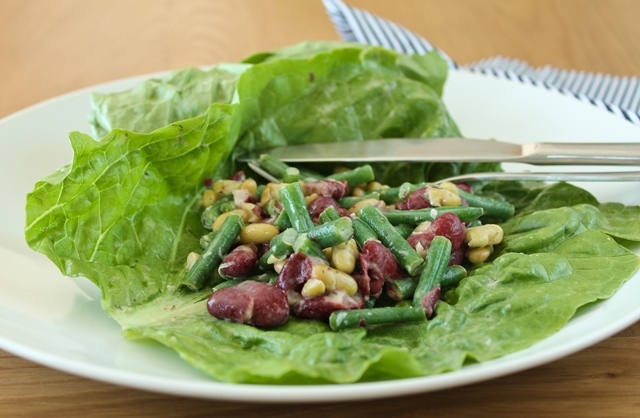 It is a *little* messy, but worth it :-) Just spoon some of the bean salad on a large leaf, trim the stem to make it easy to wrap, fold the ends in then roll up. - lots of vegan butter to spread on! Preheat oven to 200C/ 400F. Whisk all the dry ingredients together. Add the fat and cut in with a pasty cutter or two knives until crumbly. Stir in milk with a fork until it just comes together. Gently knead on a floured surface 8 - 10 times. Pat out a thick circle (about 1 1/2 - 2 ") and cut out circles, you should get 4 depending on size of cutter . 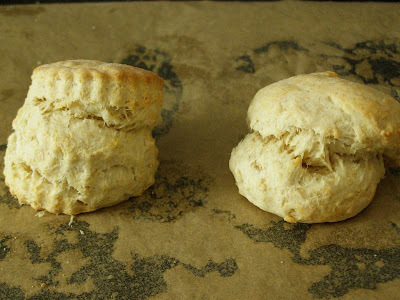 Place them on a baking sheet lined with baking paper and bake for 12 minutes or until risen and golden on top. Serve immediately split open and spread with vegan margarine. This looks great! 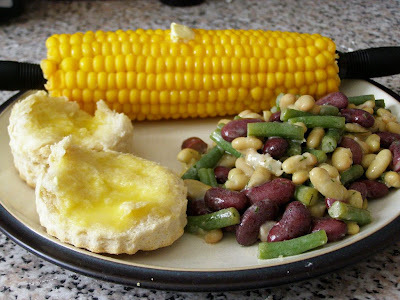 I love 3 bean, but have always served it with cornbread. I'll try it this way next. Thanks! This dinner looks scrumptious to me!